Conversation with a U.S. Ambassador: Is Spain unraveling? What insights on the Jerusalem dilemma? Will the Kurds get their country? 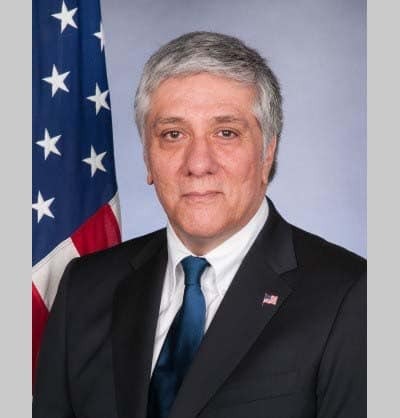 The U.S. Senate confirmed Luis G. Moreno, a career member of the Senior Foreign Service, as Ambassador to Jamaica on November 20, 2014. Most recently, Ambassador Moreno served as the Deputy Chief of Mission in Madrid, Spain. From 2010 to 2011, he served as the Political-Military Minister Counselor and Force Strategic Engagement Cell Director in Baghdad, Iraq. From 2007 to 2010, Ambassador Moreno served as the Deputy Chief of Mission in Tel Aviv, Israel. From 2004 to 2007, he was the Consul General and Principal Officer in Monterrey, Mexico. Ambassador Moreno served as the Deputy Chief of Mission in Port-au-Prince, Haiti from 2001 to 2004. He was also the Mission’s point of contact with the Multi-National Peacekeeping Force. From 1997-2001, Ambassador Moreno served as the Narcotics Affairs Director in Bogota, Colombia. He was instrumental in planning and implementing Plan Colombia. In 1995, Ambassador Moreno was assigned to the U.S. Embassy in Panama as the Narcotics Director and Law Enforcement Coordinator. Shortly after his arrival he was detailed as the Kurdish Refugee Coordinator. He oversaw the U.S. government effort in moving Kurdish refugees to Guam and assisted them in their resettlement to the United States. In 1993, Ambassador Moreno was assigned to Port-au-Prince, Haiti as Refugee Coordinator. While in Haiti, he repatriated tens of thousands of Haitians, as well as directed three political asylum in-country processing centers. After the United Nations intervention in 1994, Ambassador Moreno became the Embassy’s first political-military officer. He was also the U.S. government’s primary advisor to the International Police Monitors. Earlier in his career, Ambassador Moreno served as the Colombia Desk Officer for the Bureau of International Narcotics and Law Enforcement in Washington, DC; Deputy Director of the Narcotics Affairs Section in Lima, Peru; Staff Assistant in the Bureau of Latin American Affairs in Washington, DC; American Citizens Services Chief in Managua, Nicaragua; and Vice-Consul in Bogota, Colombia. Ambassador Moreno has received 11 Senior Performance Awards, four Superior Honor Awards, three Meritorious Honor Awards, and the American Foreign Service Association William Rivkin Award for Creative Dissent. He won the Department of State’s James Clement Dunn Award for Excellence in Diplomacy in 2001. He received the Department of State’s Heroism Award in 2004. In 2012, he received a Presidential Meritorious Service Award for his achievements in 2010 as the Principal Officer in Monterrey, Mexico and the Deputy Chief of Mission in Tel Aviv, Israel. Ambassador Moreno received a B.A. from Fordham University and a M.A. from Kean College. He speaks Spanish, French, and some Haitian Creole.